In October I didn’t discern that my neurons held an idea for a particular strong new mystery character. That was well before the accumulation of the mini-marathons that 30 days of NaNoWriMo in November ushers in, at least for many writers. This year for it, I nested online in a community of keyboarders. NaNoWriMo is a phenom that almost every writer I speak with knows about, even if participation isn’t part of their plan. Some fortunate writers who I’m cheering on with long-range agent &/or editor hopes for their just-completed novels, holed up at a delicious island, supported by cooked meals, the swish of salty air, and the focused attention of an award-winning author who dishes kindness with criticism. Brava! I was with them in spirit. I crafted a NaNoWriMo for myself, uplifted by hardworking NaNoWriMo organizers locally. My municipal liaison coach hand-made an Origami guide for each writer & treated us to an outdoors kick-off party. This was a sweet surprise & set me typing, typing, typing. I became the only writer in the entire contest assisted by Ginger, a feline who has nevertheless seen too much for his liking, of vets lately, but he’s fine, just finicky (yes his “Ginger” name is also a story.) Perhaps the blog of this author who I’ve enjoyed studying with, a visiting professor, helps explain my absence at our area NaNoWriMo write-in events. I did attend the kick-off party, channeling Big Bird. As a result of the energy from my NaNoWriMo team I have met my character, saluted her perfect name, & wondered over her dreams & her problems. Of course when I return to this manuscript-in-progess some other month, my character Sara may become Penelope Pennypress. And her dreams and her challenges will morph. And that will be a good, good, thing. I didn’t exceed my goal, 1,000 words a day – or even match it. But no complaints. In November we traveled far, beautifully celebrated our 25th anniversary, attended to some key family details that also involved out-of-town visits & noshed on an early Thanksgiving with our out-of-town college kiddo. I tackled writing details such as doing the Snoopy dance for finishing & sending out to a contest, chapters in a mystery for young readers & I organized my first blog hop with book topic Qs & As; it begins back here on Dec. 5. What I’ve begun writing next is the Thanku poetry form. This one is for NaNoWriMo. A Thanku is a Haiku of Thanks. The Thanku is one of a multitude of plum-perfect ideas to find at Teaching Authors. Say Thanku out loud to fully appreciate the term. Here is my most recent Thanku. I hope you will return here WEDNESDAY, Dec. 5th for the tag-team Q/A blog hop. Creative folks I’ve tagged who expect to run their Q/As on their blogs, on Dec. 12 will have their links on-board then. Maybe Ginger’s NaNoWriMo keyboard technique will give you a hoot. What was by my side from the Thanksgiving holidays right on through, well, it’s still by my side, is cheese. I’m not talking about the cream cheese with chives of my youth or the brie of my 30s, but the robust hard cheeses of my middle age. And If I look to share blame for this overindulgence, I will charge & convict, but spare a sentence in the Tower of London a particular volume, for being an accomplice in an abundance of cheese love. The culprit is a deftly illustrated book for ages 9-12 (& for those of us adults who read a lot of children’s books) that is also a beautifully told story of love among unlikely friends: The Cheshire Cheese Cat. Barry Moser, of his own Pennyroyal Press and many superior projects, is the artist. And that signals a lot right there. Co-authors are Carmen Agra Deedy, one of this nation’s most beloved storytellers & a rip-roaring picture book author (The Library Dragon, The Secret Old Zeb & many more.) I was ever more her fan after I met her last year at the UCF Morgridge International Book Festival. Her co-author here in this is new to me; Randall Wright is now a writer I want to become familiar with for titles such as The Silver Penny. In this collaboration, an uncommon blue alleycat, Skilley & a London chesse pub’s mouse, Pip, team up with a perfectly named girl, Nell, & a big bird. It’s fun, it beautifully carries off what the most welcome picture books do- bringing something clever to the story for adults. It also calls to mind the affection among unlikely characters in the Garth Williams-illustrated classic, The Cricket in Times Square. Surprises & secrets & yes, some sadness (watch out for that cleaver!) 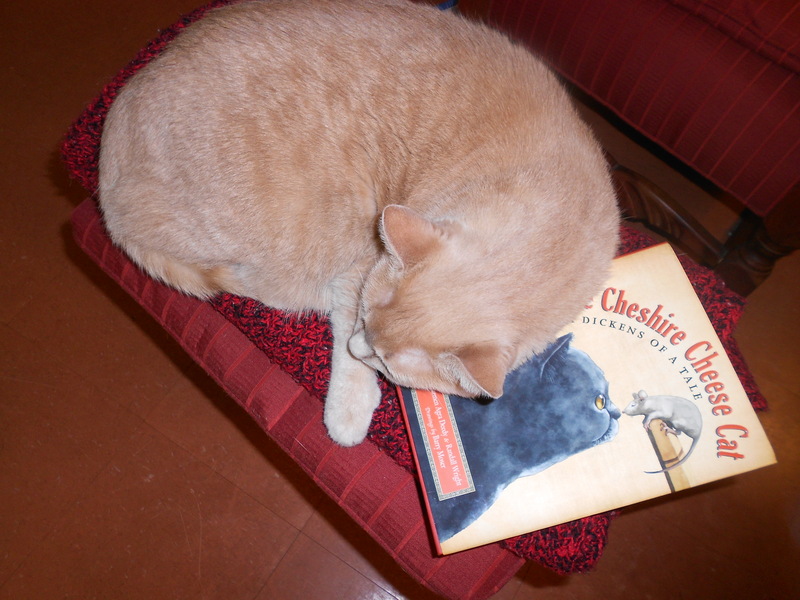 are salted through The Cheshire Cheese Cat, with a fond nod to Dickens & many atmospheric aspects of Olde London. Jon Mooallem writes in The New York Times Sunday Magazine (1.13.2008) about many things cell phone, including info on how animal groups can benefit from our olde cells. I found animal groups in Texas, Florida, Colorado, New Jersey, California & other places listed at the site. When Collective Good receives the phones, it retools them for resale, or extracts metal from them if they can’t be repaired for reuse. A part of that value is what is collected for various causes, including animal rights. The NYT magazine’s Mooallem (hope the author likes bovines, eh?) wrote that Collective Good owner Seth Heine receives 20,000 old cell phones a month. So penny by penny, it can add up. The name fits, Collective Good. You may want to follow Mooallem’s byline. He’s written entertainingly & informatively for The Times Magazine about dog breeding (2.4.2007). JET was a dog no shelter wanted. But good news for JET. His high energy level worked well in Fort Myers Florida at the Southwest Florida International Airport. JET took classes in chasing wild birds away from areas at the airport where their activities might interfere with air traffic. The result is that he beame the first documented dog to go to work in that way at an airport. He appeared on Animal Planet’s K-9 to 5 show and on Wild Rescues. JET trained his own replacement, RADAR. Associated Press reporter Julio Ochoa wrote about RADAR in a feature datelined Fort Myers, Fla 1.13.2008. The story of JET & his airport handler, Rebecca Stansifer-Haggie is told in a chapter of FLORIDA’s FAMOUS ANIMALS, out in 2008 from Globe Pequot Press. Another reason to give shelter animals another chance. Good dog, JET! And go, RADAR!